APPSC Group II Services Recruitment 2018 Notification Apply Online for Executive, Non Executive Posts @psc.ap.gov.in. Group II / Group 2 Recruitment 2018 -19 has announced for various services by Andhra Pradesh Public Service Commission. APPSC GROUP 2 Notification released for 446 Posts. AP state govt issued to fill 110 CF + 336 Fresh vacancies through APPSC the post of Group- 2 Services. The vacancies included Executive and Non Executive. Andhra Pradesh Public Service Commission Released Group II Notification to fill up vacancies Post wise eligibility qualifications How to Submit Online Application Form at www.psc.ap.gov.in . Detailed Notification which contains educational Qualificaition Schedule Screening Test Main Exam Dates Syllabus Exam Pattern Selection Procedure of APPSC Group II is here. 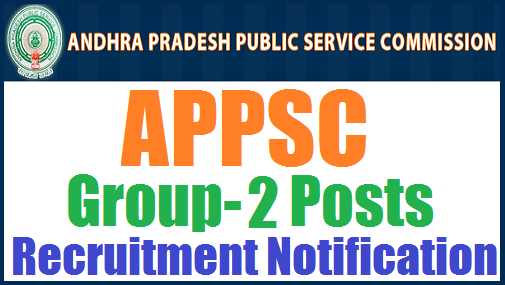 The useful information of recruitment process given such as how to apply APPSC Group 2 recruitment 2018 -19 APPSC Group 2 syllabus and pattern 2018 -19, Procedure of APPSC Group 2 recruitment, Number of vacancies, Exam dates, press release advertisement, fee structure Andhra Pradesh Public Service Commission Released Group II Notification to fill up 446 vacancies Post wise eligibility qualifications How to Submit Online Application Form at www.psc.ap.gov.in . Detailed Notification which contains educational Qualificaition Schedule Screening Test Main Exam Dates Syllabus Exam Pattern Selection Procedure of APPSC Group and many more are given here. Andhra Pradesh Public Service Commission Group-II Services General Recruitment . The Government vide G.O.Ms.No.8, Administration (Ser.A) Dept., dated:24.01.2019 has raised the upper age limit by 2 years for Uniform posts . 2. Before applying for the post, an applicant shall register his/her bio-data particulars through One Time Profile Registration (OTPR) on the Commission Website viz., www.psc.ap.gov.in. Once applicant registers his/her particulars, a User ID is generated and sent to his/her registered mobile number and email ID. 3. Applicants need to apply for the post using the OTPR User ID through Commission’s website. 4. The Commission conducts Screening test in Off- Line mode in case applicants exceed 25,000 in number and likely to be held on on 05/05/2019. 5. The main examination in On-Line mode for candidates selected in screening test will be held through computer based test on 18/07/2019 & 19/07/2019. Qualification: Applicant must possess the qualifications as detailed given in the Notification, as per the specifications in the relevant service rules and as per the indent received from the Department as on the date of notification. Refer the detailed notification given in below of this page. Age Limit: Aspirants age limits should be in between 18 years to 42years. No person shall be eligible for direct recruitment if he/she is less than 18 years of age and if he/she is more than 42 years of age as on 01/07/2018. *Age relaxation is applicable as per the government norms. Aspirants selection will be based on Written Test. Screening test is conducted as referred above, based on the Merit in screening test, candidates will be picked up in the ratio of 50 per one notified post for the main examination in order of General Merit. In case where no screening test is held, all the eligible applicants would be allowed to appear for the main examination. Asst. Commercial Tax Officer in A.P. Commercial Taxes Sub-ordinate Service- 04 Posts. Deputy Tahsildar in A.P. Revenue Subordinate Service 06 Posts. Assistant Labour Officer in A.P. Labour & Employment Sub- Service 02 Posts. Assistant Development Officers in A.P. Handloom & Textile Dept- 02 Posts. Fresh Vacancies: Municipal Commissioner Grade-III in A.P. Municipal Commissioner Subordinate Service (State wide / Multi zone) 03. Deputy Tahsildar in A.P. Revenue Subordinate Service -16. Prohibition & Excise Sub Inspector in A.P. Prohibition & Excise Sub-Service 50. Assistant registrar in A.P Cooperative societies 23. Fresh Vacancies: Assistant Section Officer (GAD) in A.P. Secretariat Sub. Service (Statewide) 150. Assistant Section Officer (Finance) in A.P. Secretariat Sub. Service (Statewide) 15. Assistant Section Officer (Law Dept.,) in A.P. Secretariat Sub ordinate Service (State wide) 01. Total Non Executive (Fresh) posts : 198. Exam/Application Fee: Applicant must pay Rs. 250/- (Rupees Two Hundred and Fifty Only) towards application processing fee and Rs 80/- (Rupees Eighty only) towards Examination Fee. • SC, ST, BC, PH & Ex-Service Men. •Un-employed youth in the age group of 18 to 42* years as per G.O.Ms.No.439, G.A. (Ser.A) Dept., dated: 18/10/1996 should submit declaration at an appropriate time to the Commission. Read: APPSC Group-II Services Syllabus- Scheme of Examination/ Pattern. 2. Search for APSPSC Group 2 notification 2018 -19. 4. Then Click on the apply online link. 5. Enter the APSPSC ID and date of birth. 8. Make the Application Fee payment. 9. View the application and Download it and save it for future.